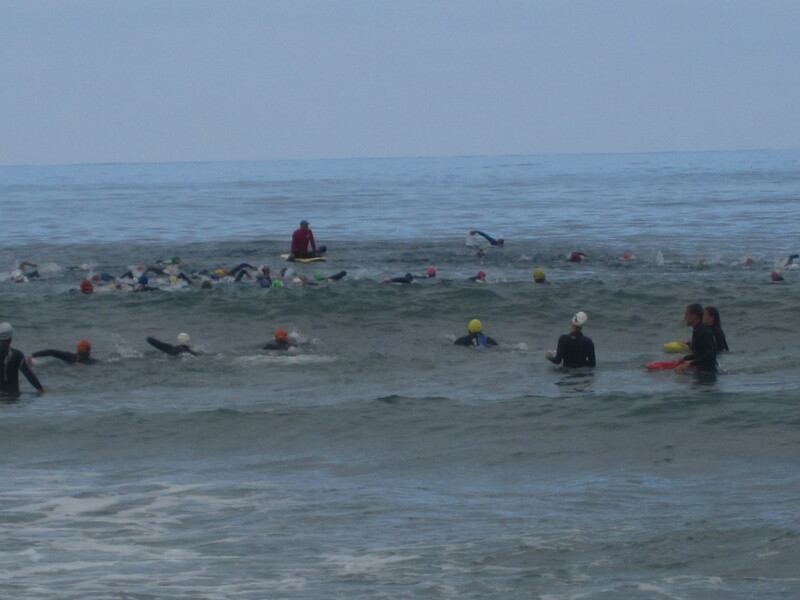 Three weeks before the big race, Nautica Malibu triathletes had the opportunity to participate in a free open water swimming clinic run by Ian Murray and the staff of Triathlon Training Series at Zuma Beach. For just the $12 cost of a USAT one-day membership, I jumped at the chance to learn expert tips on: (1) warming up for an open water triathlon swim, (2) shore start strategy, (3) entering the ocean, (4) swimming after you’ve passed the break, (5) swimming back to shore, and (6) open water swimming drills for the ocean. I happily signed my life away on the safety waiver and donned my wetsuit along with about 50 other athletes. Start off first thing by walking in and scoping out the ocean floor with your feet. Watch for drop-offs, rocks, ridges and reefs that could pose hazards. The sand shifts even from hour to hour and by entering the water to check things out, you prevent injury. Plan to do a warm-up shortly before your race start. Do it too long beforehand and you’ll burn extra energy shivering on the shore, but wait too long and you might miss the start of your wave. A warm-up can take the edge off the race-day nerves by burning off some of the adrenaline you may feel before the start. Do an easy effort for the warm-up. If you can, swim out to the first buoy and sight down the line of buoys. Check to see if there’s a building or other feature on land that you can use to sight for the race. For Nautica Malibu, there are two houses on the hill — a white one and a light blue one — that are right in sight in a line about 100 yards out from shore. If you’re out there for a practice drill and not a race, plan to do the first loop of your swim at about a 50% effort. Watch the swimmers whose “waves” start before you. See where people position themselves and gauge where you might fit in the pack. For USAT-sanctioned events, each wave can have up to 150 swimmers. For Nautica Malibu, the waves are organized by gender and age and may contain anywhere from 70-150 swimmers. If you are a confident and fast swimmer, position yourself toward the front to make an early breakaway. If you are not a confident swimmer or you know you will go at a slower pace than most, position yourself on the far edge of the pack and/or at the back of the pack. Prepare to follow the tips below for entering the ocean. One of the toughest parts of an open water swim in the ocean is the start. It can be intimidating and sap your energy — two things that make it all the more important for triathletes to practice this portion of the swim over and over again. For the clinic workout, we entered the water five times. There are four ways to enter the ocean and get past the break: (1) walk, (2) run, (3) dolphin dive, (4) swim. You will likely use a combination of those techniques that depends on the conditions on race day. When a large wave approaches you, dive under it to avoid being tumbled by it. Hold your hands out together in front of you as if you’re trying to slice through the water. You want to make your dive about five seconds before the wave reaches you. After you’ve passed the line where the waves break, you round the buoy and settle into a steady swim. Many people breathe to the left for an ocean swim. For a race like Nautica Malibu, that means you’re looking out to the ocean and can easily drift off course. Practice breathing to the right so you can sight the shore occasionally. Work toward bilateral breathing. Sometimes athletes try to swim freestyle with their heads up to aid in sighting. That can unnecessarily burn extra energy. Try swimming 10 strokes with your head down, then lifting your head briefly to sight before you turn your head to the side to breathe. Make sure to sight off the buoys or a landmark. Don’t blindly follow the person in front of you. He might be drifting off course. Be careful not to confuse the buoys with the brightly-colored swim caps of your competitors. Swim waves often are given different colored swim caps on race day and the red caps just might match those red buoys! With those colorful swim caps we look like Skittles candy bobbing in the water. If you need to catch your breath, roll onto your back and float or do a slower-paced backstroke. Triathlon rules permit you to hold onto a lifeguard’s board or a boat, but you cannot ask to be pulled forward. You need to move forward under your own power! If you practice in the ocean, the swim back to shore is where you can gain a lead on a lot of your competitors. Swim toward shore while sneaking an occasional look behind you to keep an eye on the waves. You don’t want to be swamped, and you do want to take advantage of a chance to body-surf in. Catch a wave with your body and you can pass many of those around you. You can even flip on your back for some backstroke to keep an eye on the waves, then flip forward again to body surf. If you’re going to get swamped by a wave, turn and face it in time to duck under to the relative calm. Swim and dolphin dive toward shore until you can stand up and lift your knees high out of the water. Kick your feet out to the side to break the water’s surface and gain as much speed as you can. While you’re still in the water, start unzipping your wetsuit. Peel your arms out as you run on shore. Strip down to your waist as you approach T1. The faster you get out of your suit, the easier it is. As your suit drains out the water and starts drying, it sticks to you and makes it that much harder to peel it off. Rip off your goggles and swim cap. Mentally pat yourself on the back and focus on the bike. You conquered the swim! For the swim clinic, we did the warm-up jog followed by one warm-up loop of 300 meters. We ran around a trash can on shore back to the swim start, rested one minute, and then headed out for another 3 loops. Swim 300 meters, rest one minute, repeat, for a total of 1,200 meters (just 300 meters shy of the 1,500-meter international race distance). For one last drill, we entered the water until we were neck deep. 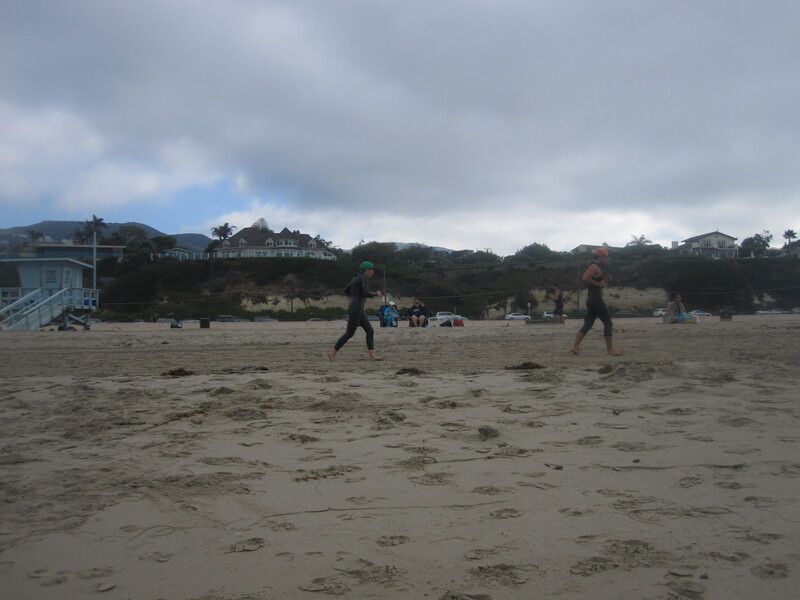 We turned around and practiced exiting the water, stripping down our wetsuits to our waists, running across the sand to the parking lot and completely removing our wetsuits any which way we could! The experts advised that at this point, three weeks before the key race, we should be swimming two to three times per week, and at least one of those swims each week should be in the ocean. Alright, I’ve shared all my hard-earned secrets, what’s your best advice for open water swimming? Wish us all luck on race day! Loved this post! I have been doing tris for about 14 years now, and have only ever done ocean swims two or three times. And they scare me! I have one coming up in three weeks, so this was so great to read. Thanks Miss Zippy! Best of luck with your ocean swim! I hope you’ll come back and let me know how it went.